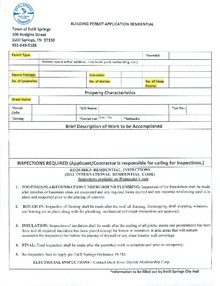 You are REQUIRED to have a building permit for any Residential or Commercial building inside the city limits. One-story detached accessory structures used as tool and storage sheds, playhouses and similar uses provided the floor area does not exceed 120 square feet. Water tanks supported directly upon grade if the capacity does not exceed 5000 gallons and the ratio of height to diameter or width does not exceed 2 to 1. Mechanical - portable heating, ventilation & cooling units. Replacement of minor parts that does not alter approval of equipment or make such equipment unsafe. If you have any questions, please contact the Town of Estill Springs, 931-649-5188. 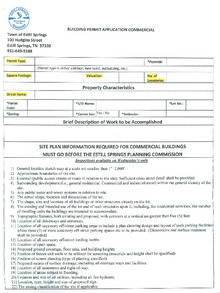 Download "Building Permit Application Residential.pdf"
Download "Building Permit Application Commercial.pdf"